Yep...you read that right...its a stone well. Nothing special. Just thought I'd try making something a little more naturalistic in ZBrush. Modeled entirely in ZBrush, but rendered out in Maya using Mental Ray. Took a few pointers from Tate Mosesian's video series on Pixologic's site, http://pixologic.com/zclassroom/homeroom/lesson/environments-with-tate-mosesian/. Tate Mosesian is the Lead Environment Artist at Naughty Dog so he's got some chops. Anyway hope you enjoy. Sorted out most of the issues I was having with the UVs. Turns out the ribbon/swirl was causing all sorts of issues when generating a UV map in ZBrush. Had to push and pull a bit to get it working properly. Here is a final comp I put together after rendering it out in Maya using Mental Ray. Simple comp with an Ambient Occlusion, Depth and Beauty Render. For the most part I'm happy with how it turned out. I've definitely got some learning to do when it comes to Displacement Maps. Let me know what you think. Another day, another key from Locke and Key, the aforementioned awesome graphic novel series from writer extraordinaire Joe Hill. Here we have the Ghost Key. Still a work in progress. The sculpt is done, but I'm getting some wacky errors when I try to create a UV map and associated textures for the body of the key. Also...I'll be experimenting with displacement maps on this one so stay tuned for shenanigans. Initial test render is looking decent. Another key from the brilliant graphic novel Locke and Key for you today. Done mostly in ZBrush and then rendered out in Maya. I'm not sold on the materials...feel more plastic than metal to me, but I've spent enough time on this one for now. I'll move on to another one shortly. Let me know what you think. Rendered out a higher res version and performed some rudimentary compositing ( Ambient Occlusion and Depth of Field ). Pretty happy with how this turned out. Let me know what you think. Working on a new piece inspired by my all time favourite film, 'Alien'. Using a combination of polygonal modelling in Maya and various booleans in conjunction with ZBrush's new Dynamesh feature to build the doorway. Then roughed in a first pass of the lighting. Still need to apply some smoothing and tackle the floor grate, but its pretty much there. Hope you like it. Went and saw Disney's latest and really quite excellent film, Frozen, for the second time. Thought I'd give rendering ice a try and here we have it. Nothing special, but a good first effort. It's an Architectural Material, using the Solid Glass Preset with a stone bump map applied to give it some roughness and an Index of Refraction of 1.31 (Ice's IOF). A more high quality render. As you can see the area light in the foreground is being treated as a transparency by the PNG. Metal still feels too glossy. It probably needs to be anistropic to get the feel I'm looking for. Other than that, the black plastic and black metal are a little too matte. 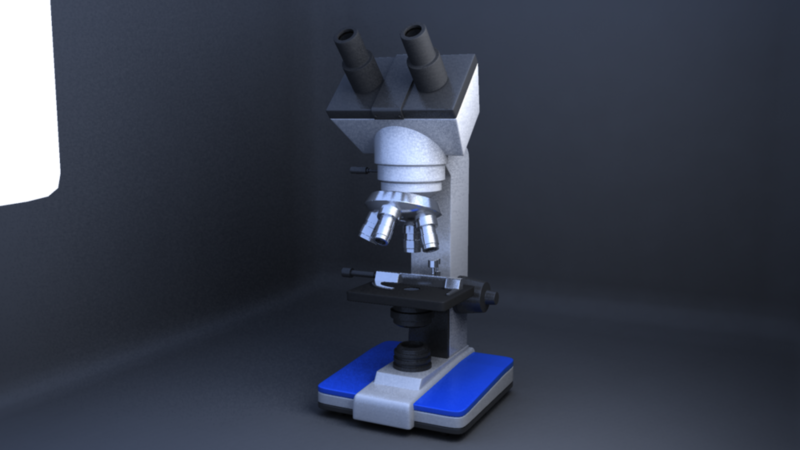 Just a quick lighting and material pass on the microscope. The black plastic isn't black enough and I don't know if the reflections aren't glossy enough or if the surface itself is too reflective at the moment. Clearly the metal looks wrong...very...very...wrong. Too glossy and too stock Architectural Chrome which I used as a base to work from. Light is a Portal Light with a Mental Ray CIE plugged into the Color Multiplier Attribute. This is a trick I picked up from the Mental Ray course I took through CG Society and its a great one. Gives a really nice light and its a great way to control the colour and intensity of your light. Well...not that speedy, but an evening's worth of work. Got my buddy to pitch a few ideas and Microscope stood out as a fun little challenge. 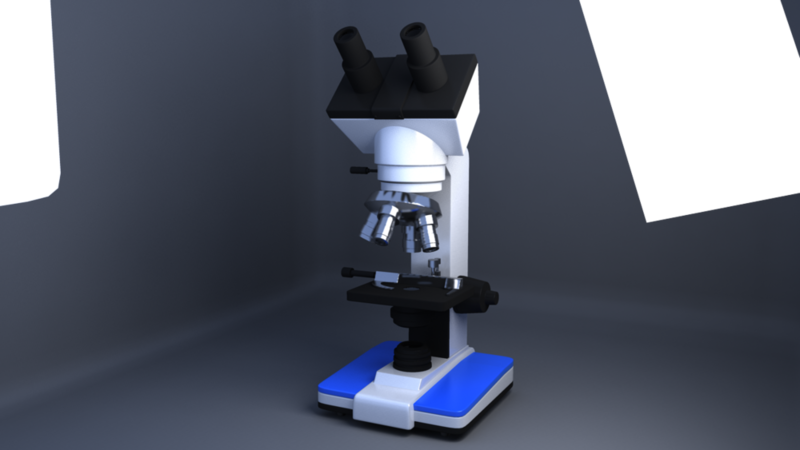 I referenced an Omano Microscope here. Initial Final Gather Render with no material work and no lighting. Getting to a near final state with the Render. 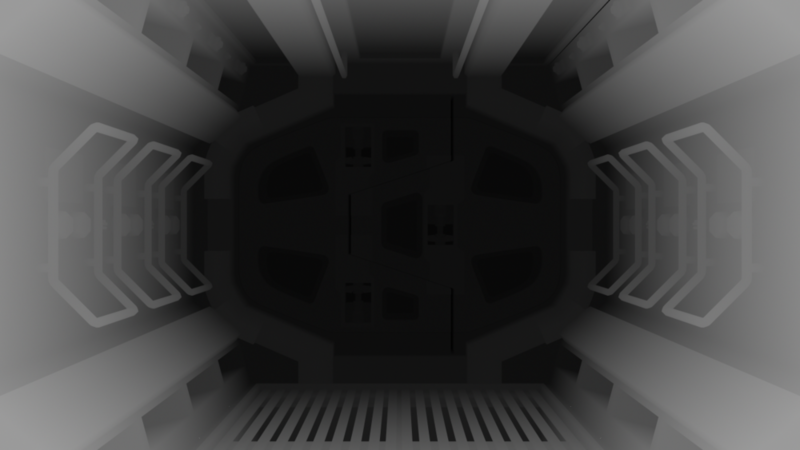 The metal texture on the lights and vent isn't looking good yet and after that a little post work, but its getting there. Getting there. Still very noisy...which happened the moment I pushed the Area Lights up into the fixtures. Not sure whats going on there...will investigate. More Texture work to come. Working with the Mental Ray Architectural Shaders in Maya to get a nice look before tackling the actual textures. I might be doing this the wrong way around (Shaders before Textures) I'm not sure, but it feels like a good approach. As you can see...the lighting is starting to look pretty good, but very dark along the right hand side. Will have to add in some more lights over there. The next step is to finish up the texture maps, and push the Area Lights up into the Light Fixtures instead of just sitting on top of them. Currently working on a small modelling project. 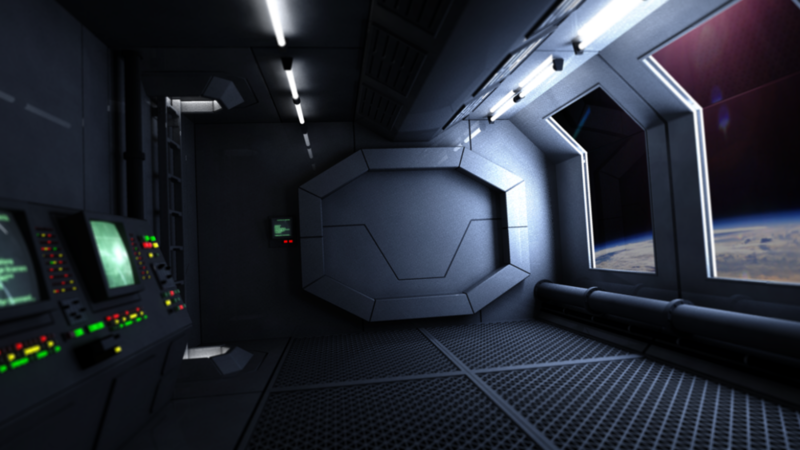 I've been following Roel Coucke's Sci-Fi Game Environments course on Digital Tutors. I have already learned a bunch of great little tricks that will come in handy down the road...most of all the now completely obvious, but brilliant idea of using 'Guide' meshes. Simple planes and shapes that you can snap vertices to when trying to get that exact angle or line things up just right. Anyway...the following shots are from my Space Station corridor. Currently a work in progress. 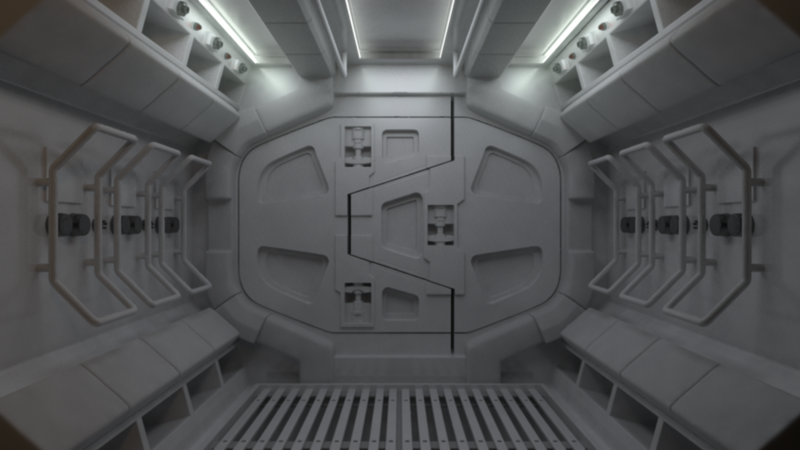 I've attached a wireframe shot, a real early rough pass at texturing and an early lighting pass.